There is overwhelming evidence that a lack of sleep is not being taken seriously enough in our society. Sleep deprivation drastically dampens our reaction time and attentiveness. The engineer of the NYC metro train that derailed recently reportedly began drifting off as the train reached speeds nearly three times the limit. This person's lack of sleep derailed more than just a train, it also ended the lives of 4 New Yorkers and ploughed into the plans of more than 60 others. This is no anomaly. Lack of sleep has been a key factor in some of the biggest disasters of the last half-century: the 1979 nuclear accident at Three Mile Island, the 1986 nuclear meltdown of Chernobyl, and the Exxon Valdez oil spill in 1989-- just to name a few. Beyond the high profile disasters, lack of sleep kills an estimated 1,550 people in the US each year, according to the National Highway Traffic & Safety Administration. That's 387 Metro-North disasters. "The sleep situation in our society has become a terrifying problem," explained Dr. Jessica Payne, head of the Sleep, Stress, and Memory Lab at Notre Dame, and advisory board member for the NeuroLeadership Institute. 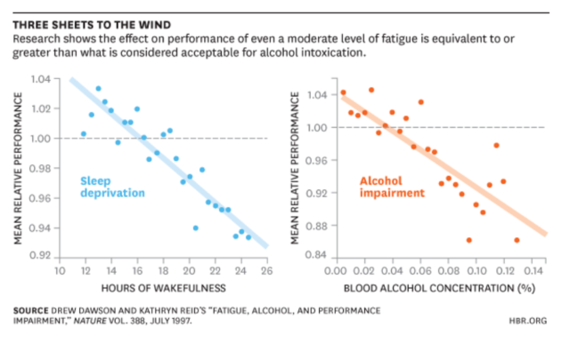 "If you're not getting enough sleep before work, research shows you might as well be working drunk". This is not just a metaphor. According to Dr. Charles Czeisler at Harvard Medical School, a week of sleeping four or five hours a night induces impairment equivalent to a blood alcohol level of .1%. 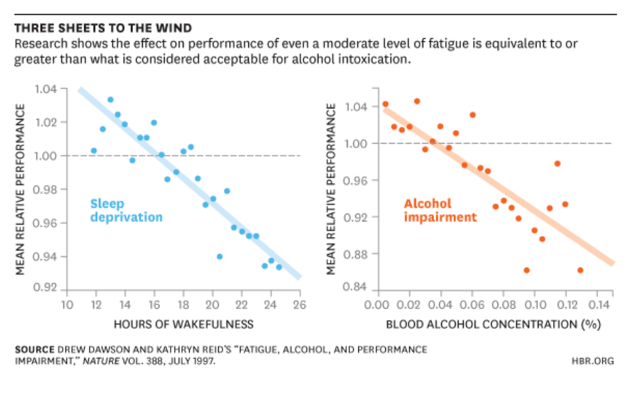 In fact, a study way back in 1997 showed that actually it was probably safer to be drunk than sleep impaired once you hit a certain level. We have taken great pains to educate society about drinking and driving. Few people take a boozy lunch anymore but expect this to be acceptable. Being sleep deprived is almost seen as a badge of honor. A sleep-related error at work might not be as obvious as a train or auto accident. However it could be the cause of sending that bad email, making a terrible trade, delivering an inappropriate remark, or any number of cognitive faux pas that might derail one's career. President Clinton is reported to have said he made all his worst mistakes while sleep deprived. Sleep issues are not just causing mistakes, they are affecting our whole workforce. Researchers at Harvard Medical School estimate that sleep deprivation costs US companies $63.2 billion in lost productivity per year. The fix doesn't have to involve completely changing one's life. In a paper called The Healthy Mind Platter, Dr. Payne and other researchers outlined the seven types of activities that the brain needs to function at its best. People tend to pay attention to diet and exercise, yet sleep may turn out to be more important for overall health. The good news? It turns out that taking small steps to improve your sleeping habits can have enormous benefits. Dr. Payne says, "Simply adding an extra 20 minutes to your sleep cycle increases performance two-fold". Research is beginning to have us question where we put our attention as a society, questioning what we should care about. If we want to avoid any kind of derailing, perhaps it's time we all paid more attention to sleep.